The Husky 1/4 inch Universal Coupler is designed to fit in most popular styles, including industrial and automotive. 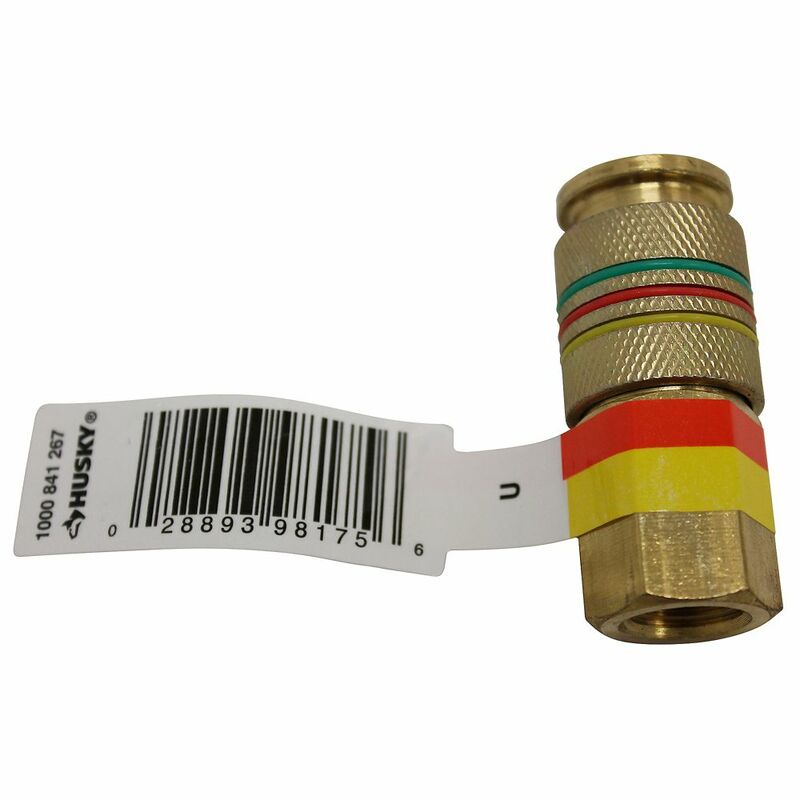 The coupler features a female fitting that allows for a direct connection to an air hose. It has a sleeve guard that reduces the potential of accidental disconnects and works to protect the coupler sleeve. This brass coupler is a perfect addition to any garage. Bostitch Coil Ardox Galvanized Nail - 3 1/4 In. The Campbell Hausfeld angle die grinder (CL254100AV) features a right-angle head for easier access into tight spaces. Designed for operator comfort, this die grinder includes a contoured rubber grip and integrated deflector to adjust exhaust direction. It also includes a 1/4-inch and 1/8-inch collet for maximum versatility. Rated Power: .45 HP, Free Speed (RPM): 18000 Air Consumption Avg. : 12.8 SCFM, Air Consumption Cont. : 29.5 SCFM, Air Inlet: 1/4 in. N. Finish your projects faster and easier with Campbell Hausfeld - The Air Power Expert. 1/4 Inch FNPT Combo Coupler The Husky 1/4 inch Universal Coupler is designed to fit in most popular styles, including industrial and automotive. The coupler features a female fitting that allows for a direct connection to an air hose. It has a sleeve guard that reduces the potential of accidental disconnects and works to protect the coupler sleeve. This brass coupler is a perfect addition to any garage.